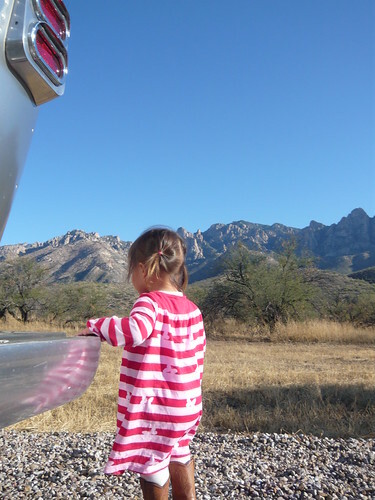 Mali Mish – Tucson or Bust. Our first night on the road was a success! Sure it was annoying to fall asleep to Santa Claus is Coming to Town but it put me in a great mood when I opened the Airstream door first thing in the morning. Fa La La La La La La La Laaaaaaaaaaa. Since we didn’t appear to be in the way of those crazy Wal-mart shoppers, we grabbed a quick bite to eat at Paradise Bakery and Café and spent a few minutes playing a the “playground” (aka undeveloped rock area of the parking lot). 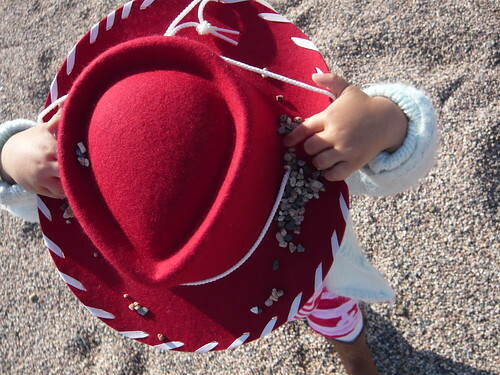 As you can see above, Ava had a blast throwing the teeny rocks on top of her spankin’ new red cowboy hat. I love that Ava doesn’t need real toys to enjoy herself. The world around her will do just fine. On our Zee Maps, we had a couple spots we wanted to visit while in Pheonix, like that pizza place rated number one by Oprah (who is always right…. Dan stop rolling your eyes) but we wanted to get to Tucson. It was calling our names. 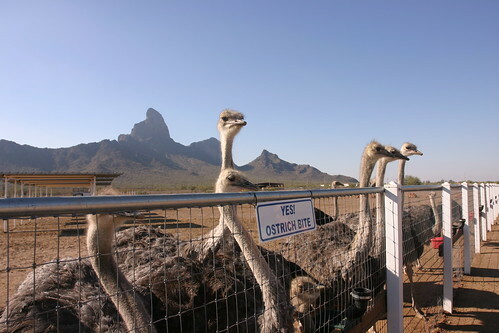 On the way to Tucson, we stopped by the Rooster Cogburn Ostrich Farm. They had crazy big monster trucks that scared the crap out of Ava. They had ostriches that scared the crap out of all four of us. It was awesome! And they had the sweetest deers you’d ever meet in your whole life… and some thirsty, THIRSTY lorikeets. Highly recommend it as a stopover if you are ever on that stretch of road. More pictures to follow when we get back into town. 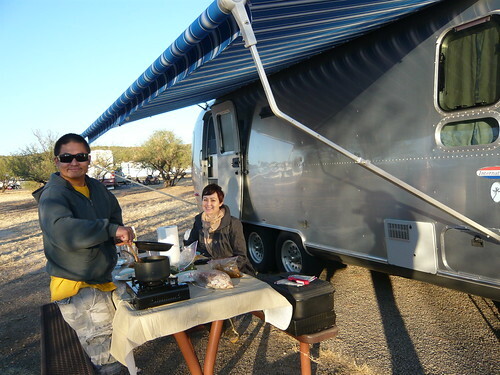 We arrived at one of our favorite state parks…. Catalina State Park. The mountains in the background are so beautiful that they almost seem fake. Almost. We found a great spot with hook-ups and settled in. We threw Ava in her tent bed for an overdue nap and we threw our Thanksgiving leftovers on the portable stove for an overdue lunch. Road trip. Round Two. Ding ding ding. One Response to Tucson or Bust. Catalina State Park looks gorgeous! The sky is so blue and the mountains are so beautiful!